Just a few short years after the end of its brutal civil war, Sri Lanka--with its rambling temple ruins, leafy tea plantations, and wide golden beaches--is bursting with optimism (but not the crowds). The shift from peace to war can be famously abrupt, with neighbors turning on one another with little apparent provocation. Placid communities can become bloodbaths in the blink of an eye (Kosovo, Syria). Rebuilding in the wake of a terrible war, by contrast, usually takes decades. But Sri Lanka has managed a rapid shift from some of the most horrific carnage in recent history–a civil war that raged for more than 25 years and produced 100,000 casualties–to a peace that not only unites the country’s previously divided ethnicities but inflects the experience of any visitor to the island. Gone are the roadblocks that were scattered across the landscape; gone are the once-ubiquitous photos of Sinhalese Buddhist President Mahinda Rajapaksa, who in 2009 brutally trounced the equally vicious Tamil Hindu LTTE, or Tamil Tigers, who had waged a ruthless guerrilla war aimed at building a separate Tamil state. Gone, too, are the white vans into which Rajapaksa’s victorious government, basically a nepotistic dictatorship, allegedly whisked people who said the wrong things. In their place is a new unity and openness evident in everything from the “1 Team, 1 Nation” cricket banners lining the roadsides in the capital city of Colombo to the dinner plates at one hotel that were ornamented with both Sinhalese and Tamil alphabets–two populations’ differences now recorded on decorative crockery rather than in violent bloodshed. Sri Lankan Parliament Complex. Photo: Kolitha de Silva. Source: Wikimedia Commons. Their resilience reflects the hard-won equilibrium of a country already deeply changed by conflict and loss. The Portuguese came to Ceylon, as the island was known, in 1505; they were routed by the Dutch in 1658, and by 1796 the Dutch in turn had ceded to the British, whose departure in 1948 laid the ground for an ethnic conflict that would later surge between the once-powerful Sinhalese and Tamils. Then there was the infamous 2004 tsunami, which claimed more than 30,000 lives on the island. Today, however, the coastline has been largely rebuilt, and international investment, especially from China and India, has started to create a coherent infrastructure. Because President Sirisena has tackled the nation’s most pressing internal issues–fighting racism, forging a single national identity–Sri Lanka is finally able to look outward. Even if this were not a place of immense natural and historical wonders, it would be worth going there now to see what fresh liberty feels like. Sri Lanka is something of a three-in-one destination: In 18 days, we experienced historic and cultural sites worthy of Kyoto, a Serengeti-level safari, and an Amalfi-caliber beach vacation. My husband and I took our seven-year-old son, and found that Sri Lanka is warmly disposed toward children–everyone called him “darling” or “baby,” and our driver, Madhawa, showed a sweetness with him that often made us feel like mean-spirited disciplinarians. Tourism is not yet saturated: You see relatively few Westerners, and the primary visitors to Sri Lankan sites are Sri Lankans, other South Asians, and an influx of Chinese. That said, Sri Lanka operates at its own pace: Sometimes when you are told something will take an hour, it takes 90 minutes; sometimes when you are told an hour, it takes five. Temple of the Tooth Relic, Kandy, Sri Lanka. Photo: William Cho. Source: Wikimedia Commons. As such, it took five hours to drive the 72 miles from the bustling seaside capital of Colombo to the inland Cultural Triangle, defined by the ancient cities of Anuradhapura, Kandy, and Polonnaruwa. 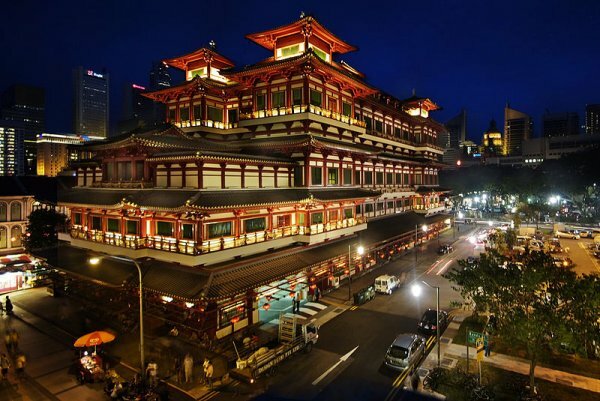 The historical monuments there–five of them UNESCO World Heritage Sites–reflect a society that was at one time among the most sophisticated in the world. The once walled city of Anuradhapura was the Sinhalese capital from around the fifth century B.C. until the tenth century A.D., its palaces and monasteries irrigated by an elaborate network of reservoirs and hydraulic engineering. The site complex features stepped pools, stone pillars, and a proliferation of stupas: great hemispheric, plastered, and sometimes gilded receptacles for holy relics. The city’s 2,000-plus-year-old Jaya Sri Maha Bodhi, or holy fig tree, reputedly grown from the very tree beneath which the Buddha attained enlightenment, is among Buddhism’s holiest sites. 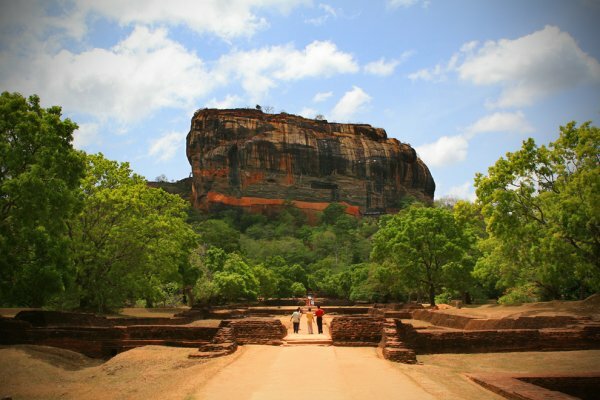 About 45 miles away, the fifth-century fortress of Sigiriya lies atop a 656-foot, souffle-shaped rock that’s a sort of Asian Machu Picchu. It is 1,200 steps to the top, and there were moments when I felt that climbing this crowded stone stairway to heaven in 92-degree heat seemed a misguided idea. But the ancient urban planning makes for a worthwhile spectacle. You go up past frescoes of harem beauties, past a yellowing rock wall so polished it is called a mirror, through a gate that used to be the maw of a massive lion (only its gargantuan paws remain), and ascend to a plateau of ruined palaces and ample pools overlooking central Sri Lanka. Buddhists like stairs, apparently, and we next climbed the 364 steps to the top of the nearby Dambulla rock temples–mountain caves claimed as a holy site more than 2,000 years ago and drenched in colorful Buddhist and Hindu scriptural imagery of deities. Sigiriya Rock, near Dambulla, Sri Lanka. Photo: Ela112. Source: Wikimedia Commons. The main hub of this historical area is Kandy, which surrounds a lake and is full of sundry shops and winding alleys and cafes. Everywhere, it seems, the new Sri Lanka is moving toward a coherent identity that reconciles its ancient history, the long shadows of colonialism, and the vitality of a country reawakened by peace to its own civility. We visited the Temple of the Tooth, where one of the Buddha’s molars is kept (odd to pay tribute to an enduring tooth in a place called Kandy), and whose frescoed walls were restored after a 1998 LTTE bombing. We stopped by the eerie Helga’s Folly, a decrepit 1930s hotel that feels like a tropical outpost of The Addams Family, with dingy black rooms full of far-fetched Victorian furnishings and the waxy residue of a thousand spluttering candles (come for a drink, but not more); then cooled off at the vast botanical gardens nearby–a vestige of British colonial rule, full of impossibly tufted trees and delicious ferns. It would be wrong to believe that a cultural tour of Sri Lanka involves only historical monuments. The island-nation has always been a crossroads of trade and of cultures, which has kept it a vibrant nexus of creativity and intellect in its modern era, as in the one before. Not far from Sigiriya and Dambulla is the late architect Geoffrey Bawa’s iconic Kandalama Hotel, built in 1947. A hymn to the gently hilly, wooded countryside, the large horizontal building, with its clean lines and forgiving openness, is a perfect example of the Sri Lankan modernism that Bawa helped pioneer. 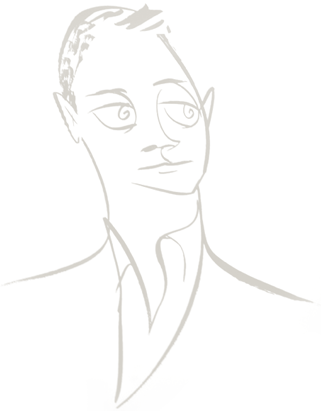 Refined, elegant, privileged, and gay, Bawa studied in England but chose to stay in Sri Lanka, where he pressed his high-society compatriots to celebrate their locality rather than mindlessly ape European models. Bawa is widely known in Sri Lanka as the father of “tropical modernism,” a style defined by Spartan austerity infused with a jungled richness. 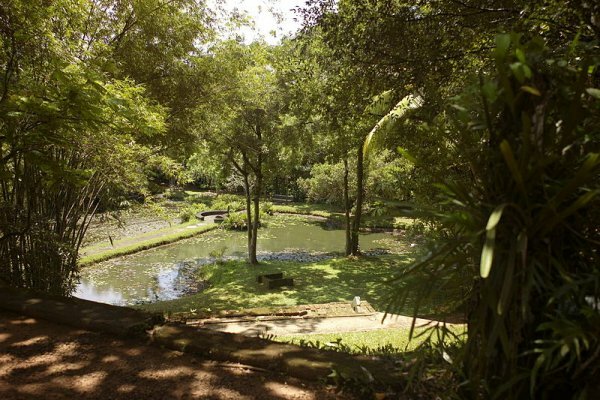 Bawa, also a garden designer, cultivated his landscapes in typical Sri Lankan fashion, to run riotously and wild. Combining the spare and the raucous in equal measure, his most famous buildings on the pilgrimage circuit–Lunuganga, his country estate near Bentota; Number 11, his own home in Colombo (open by appointment); his Last House, on the ocean in Tangalle (now a boutique hotel); and most grandly, the Sri Lankan Parliament–are kind of a metaphor for the whole culture. 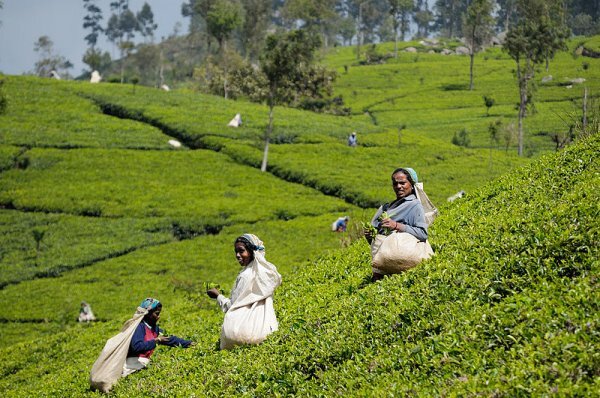 Harvesting tea, Sri Lanka. Photo: Christophe Meneboeuf. Source: Wikimedia Commons. Tea is not only a reassuring beverage but also an attractive bush–a cousin of the floral camellia, after all–and in the panoramic tea country of Sri Lanka’s central mountains it grows in millions of orderly rows on vast, lush, vertigo-steep acreage up to the edges of the dense jungle. Tea was introduced by the British to the island only in the nineteenth century, and took off gradually until the Scotsman Sir Thomas Lipton revolutionized the way it was processed, packaged, and marketed. The roads in this area are winding, narrow, and unpaved, but the landscape is so beguiling that you relish the slow pace that lets you take it in. Madhawa seemed unfazed by these challenges and remarked that tea was one of the only aspects of the country that had gone largely untouched by the dark years of conflict. New plantations and old, many with their names spelled out in letters as big as the HOLLYWOOD sign, beckon. Tea is harvested by hand here, and mostly by women, because the men are said to be less meticulous and because women have smaller hands better suited to the work. Each is assigned a seasonal plot, and pride of stewardship accounts for the incredible uniformity of the bushes’ height and form. The standard visit to the Dilmah tea factory to observe its workers sounded rather like a Soviet propaganda exercise but proved to be delightful–the tea-sorting, withering, oxidizing, and fermenting equipment cheerfully antique and the subtleties of tea-grading by quality curiously fascinating. We spent two nights at Ceylon Tea Trails, a hotel that has long been considered the ultimate in Sri Lankan luxury, with handsome bungalows above a picturesque dam-made lake. We preferred the more recently refurbished estate house at Thotalagala, a three-hour drive farther on, where we felt like personal guests of Sir Thomas Lipton. It is rather politically incorrect to be nostalgic for colonialism, but if anything is going to tempt you down that problematical path, it is this establishment, at once simple and gracious, with delicious curries, an elegant, old-fashioned tea with scones and finger sandwiches and cakes, highly personalized service by white-coated butlers, and a panoramic, undulating vista. There’s nothing to do at Thotalagala; I wanted to stay for six months, write a book, go for walks, and get fat. Throughout our journey, we had a preponderance of divine Sri Lankan food and nearly inedible British colonial food, bland recipes incompetently prepared. Steer clear of all the beef Wellington, the pasty cream soups, the boiled vegetables. Sri Lankan food, like Sri Lanka itself, has an Indian feel but is gentler and somewhat milder. India for beginners, a friend called it. The curries are not thick and creamy; they tend to be light and vivid. I was particularly taken with the brinjal (eggplant) curry on offer everywhere, braised to a tangy caramel–but each Sri Lankan meal has 8 or 10 or 12 curries, and the glory is tasting them in contrast to one another, flamboyant stripes of flavor with white and red rice to balance each mouthful. The country is also famous for crab, best eaten rather messily at the Ministry of Crab restaurant in Colombo. For breakfast, we took to string hoppers, filament-thin rice noodles served with a variety of condiments (or in our son’s case, plain). Elephants at the waterhole, Minneriya National Park, Sri Lanka. Photo: Al Jazeera. Source: Wikimedia Commons. For an island that has been inhabited for thousands of years, Sri Lanka has a surprisingly robust population of wild animals that exist reasonably peacefully with humans. We hit Minneriya National Park, where elephants go in the dry season to eat the sweet grasses exposed by the receding waters of a massive reservoir built some 1,700 years ago by one of the Anuradhapura kings. There is nothing more quietly noble than elephants at sunset, their loose skin giving them an aura of seniority, their small eyes blinking attentively, their trunks looking at once balletic and clumsy. We counted 125 in the course of an hour, though we could have counted a similar number of jeeps congregated to watch them. The coastal Yala National Park has the highest concentration of leopards of any park in the world. Our knowledgeable ranger was supplied by our hotel, the Chena Huts, and he advised us to rise before dawn to see the animals. Groggy and exhausted as we boarded our four-by-four, we came quickly to life at the parade of fauna, and when a leopard sauntered across the road not ten feet in front of us, we were silenced by his sinuous majesty. In two days, we saw four of them, along with elephants, a golden-backed jackal, innumerable peacocks, herds of spotted deer, wild and domesticated buffalo, wild boar, some deceptively docile-looking crocodiles, mongooses galore, a sand boa, and a great fiesta of gray langur monkeys, not to mention the birds: green bee-eaters, Sri Lankan junglefowl (the national bird), painted storks, and a grand-looking gray-headed fish eagle. Sri Lanka is ringed with beaches, and some of the relaxed feeling of the place is owed to these sandy expanses, which let onto the Bay of Bengal, the Indian Ocean, and the Laccadive Sea. The water was rough when we visited Tangalle, Weligama, and Bentota in the south, where the long beaches border lively towns and are fringed with welcoming palms. There are temples of various kinds to visit along the coast, and the highly touristic matter of the stilt fishermen, who perch on tall wooden poles above the shallows to avoid frightening the fish. They have discovered that modeling is more lucrative than fishing, and so, regardless of the presence of marine life, they pose on their stilts, rods in hand, trying to look exotic. They will also put you on a stilt; they will even put a fish on the end of your line for the photo. 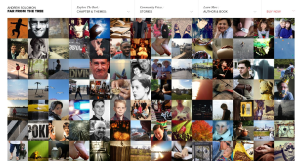 It’s good fun nonetheless, especially if you are traveling with a child. 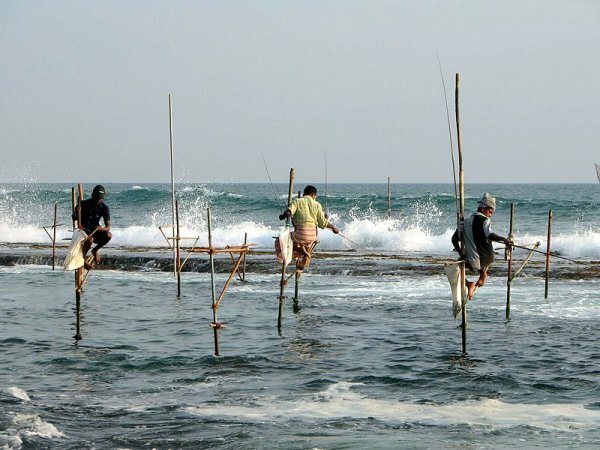 Fishing on stilts in Sri Lanka. Photo: Bernard Gagnon. Source: Wikimedia Commons. Up the coast, the seaside colonial city of Galle has become a chic weekend destination with a thriving artistic community–a gathering place for wealthy natives of the capital who want a real escape. We strolled through its narrow streets, shopping for jewelry, local textiles, and dubious antiques, and dining in its historic fort area, whose thick stone ramparts, from the Portuguese and Dutch eras, saved this entire area from the 2004 tsunami. We had dinner by the pool at our hotel, Amangalla, housed in a seventeenth-century fortress, amid more than 200 votives on tiny platforms in the surrounding hedges, with a violinist quietly playing traditional music. The hotel, like the town of Galle, seemed to epitomize Sri Lanka’s mix of the elegant and the chaotic, the historical and the modern, the artistic and the prosperous. We attended a dinner party one night in Bentota, an hour north of Galle, hosted by Taru Fonseka, the owner of Taru Villas, a group of eight villa hotels across the south of the country. The guests were Sinhalese, Burgher (white Sri Lankan), Christian, and Tamil (Hindu). A Tamil Hindu woman told a story about being at a fashion show in Colombo, seat of the Sinhalese government, during a Tamil LTTE air raid in 2009, and described how even as she fled the Taj hotel she was heartened that the Tamil voice was being amplified. The other Tamils at dinner protested, and the conversation grew animated, but it was friendly and forgiving of even profound differences of opinion–more so than many prandial standoffs between Democrats and Republicans back home. “We are finished with war, but we are not yet at peace,” an architect friend, Anjalendran, who is also Tamil, had said when we visited him at his home earlier in the trip. 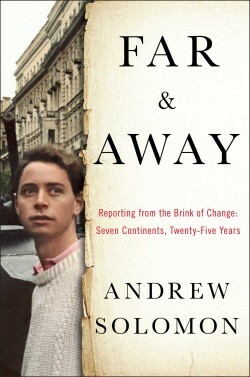 But even he conceded that he had tremendous hope, after years of entrenched pessimism. 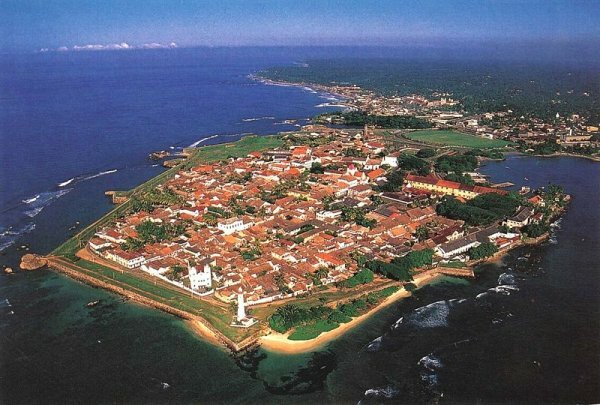 Aerial view of Galle. Photo: Galle Media Works. Source: Wikimedia Commons. We spent our last two days in Colombo at the grand dowager Galle Face Hotel, which overlooks one end of an oceanfront park, a respite from the city’s bustle of old shops and new skyscrapers. On a weekend, hundreds of amblers thread their way among rows of beach umbrellas and food carts. The sky was a riot of kites, so thick in the blustery breeze that it was a wonder there were no tangles in the airborne traffic. As sunset approached, the crowd swelled before the daily lowering of the giant national flag, with its ancient golden lion on a red field surrounded by four leaves of the sacred Buddhist fig tree, and set off by an orange stripe for the Hindus and a green one for the Muslims. The scene was somewhere between an outdoor rock concert and an egalitarian version of Seurat’s pointillist Sunday on La Grande Jatte. Beholding this model of civility en masse, I found it impossible to imagine the long stretch of beach to the north where, only seven years ago, thousands of civilians were killed in the last onslaught against the Tamil Tigers. Heritance Kandalama Hotel, Dambulla, Sri Lanka. Photo: Asheesha88. Source: Wikimedia Commons. Our trip was arranged by Ampersand, an excellent London-based company specializing in Sri Lanka and Southeast Asia. It is a knowledgeable and attentive operation that pulled off our protracted odyssey without a hitch. They hired a driver/guide, which is the best way to see the country since public transportation is lacking and roads are challenging. My favorite hotels were Thotalagala and Amangalla. We also stayed in two Uga Escapes hotels–Ulagalla and Chena Huts–which were immaculately comfortable. The hotels owned by the Dilmah tea company–Ceylon Tea Trails and Cape Weligama–are the only Relais & Chateaux in Sri Lanka and are indeed comfortable, if a bit short on charm. In Colombo, the Galle Face Hotel, one of the country’s oldest, has just been restored to its former grandeur. We had lunch or drinks at Sri Lankan-owned properties such as the Kandy House, the Last House in Tangalle, Mirissa Hills near Weligama, Paradise Road the Villa Bentota, the Galle Fort Hotel, Jim’s Farm Villas near Matale, and several of the wonderful Taru Villas. 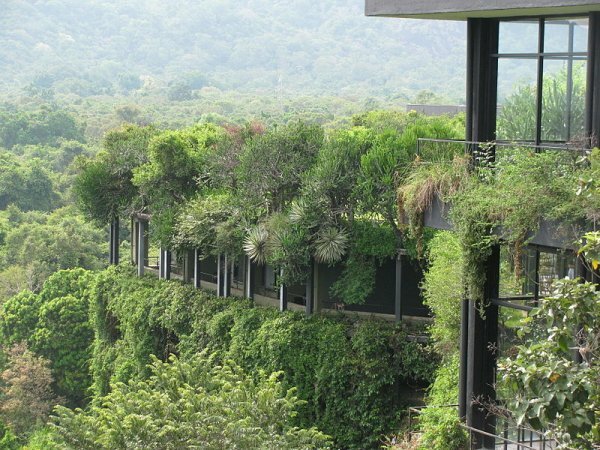 They may be less glossy than other hotels, but they have an aura of authenticity, and many show the influence of Geoffrey Bawa’s disciplined originality. Lunuganga, country estate of architect Geoffrey Bawa, Benota, Sri Lanka. Photo: Labeet. Source: Wikimedia Commons.